Te Rawhiti Marae is governed by the Marae Trustees, whose primary responsibility is the effective management of Marae affairs, properties, assets and usage. There is a Te Rawhiti Marae Charter, which is the combined effort of both hapu. 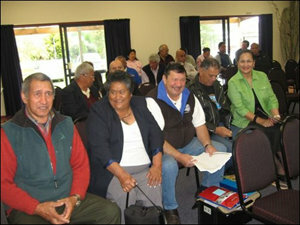 Some members of the Te Rawhiti Marae Trustees Committee and the Te Rawhiti Marae Development Committee. Extending and upgrading the Marae building to better accommodate the increasing flow of whanau and visitors to the Marae. Building the capacity of local community and whanau through a series of training and development wananga and workshops. Te Komiti Wahine This committee are made up of women who both cater for and maintain the wharekai and wharehui for the Marae. Te Rawhiti Toi Maori Roopu This group is a gathering of artists and interested people who will design and plan the decoration of the Marae. It has its own budget granted from Waka Toi. Te Rawhiti Marae Resource Centre The administration and use of the Centre is to be established. The facility is available to the community through the Trust. Te Rawhiti Marae Archive Committee The Archive administration is to be established. It will hold the written material, taonga and electronic data of Te Rawhiti. Te Rawhiti Marae Strategic Plan This Plan was formed by the Hapu to forge a path forward keeping the Marae as a platform to unite people, to inspire people and to bring them together to assist them to determine their lives productively. It sees the Marae as central to future developments culturally, socially, educationally, environmentally and economically. 2 Responses to "Marae Management"
Is there anything organised for ANZAC day at the the Marae, 25/04/2015. We’ve just published some ANZAC day information on the site. http://www.terawhitimarae.maori.nz/community-news/te-rawhiti-marae-anzac-day-2015/ Enjoy!